Abdominal Binder :: Braces and Supports :: Core Products Int., Inc.
Oh, your aching side. Our versatile abdominal binder will help relieve a multitude of aches and strains to your ligaments and joints. 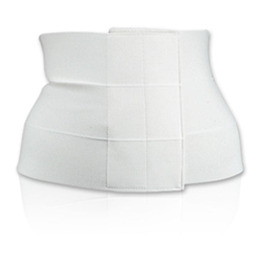 Use it as an ab binder, a back support, a rib belt or a post-operative belt. The binder features a CorEdge® finish for comfort. For a proper fit, measure around the widest part of your torso. SM/MD fits 24" to 36". LG/XL fits 36" to 48". Small - 28' - 32"